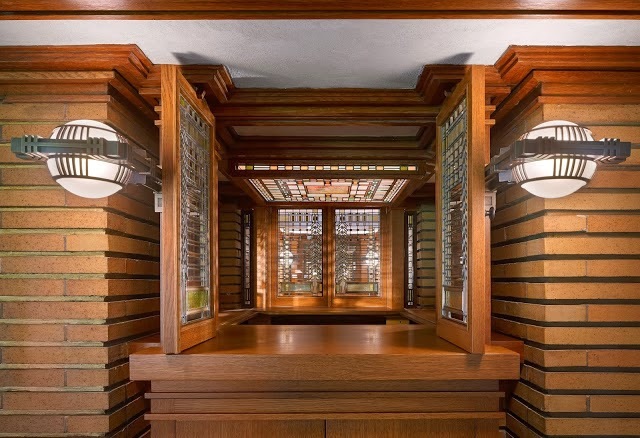 An important aspect of Frank Lloyd Wright's concept of organicism in architecture was drawing design inspiration from natural forms, textures and colors. Wright describes his preference and prescription for a natural palette in his his 1908 essay "In the Cause of Architecture:"
...go to the woods and fields for color schemes. Use the soft, warm, optimistic tones of earths and autumn leaves in preference to the pessimistic blues, purples, or cold greens and grays of the ribbon counter; they are more wholesome and better adapted in most cases to good decoration. The interior of the Martin House is an outstanding example of this prescription fulfilled; in this case, however, Wright didn't exactly go to the "woods and fields." Rather, he went to the Olmsted-designed landscape of Parkside. The color palette of the Martin House - greens, golds and browns - is inspired by the leaves of a Parkside October - more specifically, by the vibrant yellow-green of ginkgo trees in autumn. 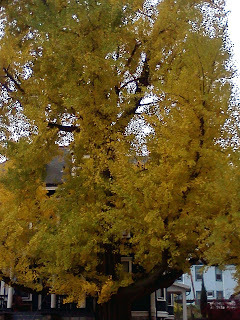 The resonance between the color of autumn ginkgo leaves and the colors of the Martin House interior came as a revelation in 2006, when the Reception room was partially furnished and painted in an temporary approximation of the original wall colors (left). This palette of wall color, upholstery, carpeting and art glass is all the more evident today, when the room is fully restored. For that matter, the ginkgo connection to the Reception room is all the more strategic when you consider that the young ginkgoes were planted at (or around) the same time the colors for textiles and walls in the house were being planned. So Wright didn't so much draw his palette from the existing landscape, but from his ideal vision of an artificial "prairie" in Parkside, accented with Asian species (ginkgo and wisteria). 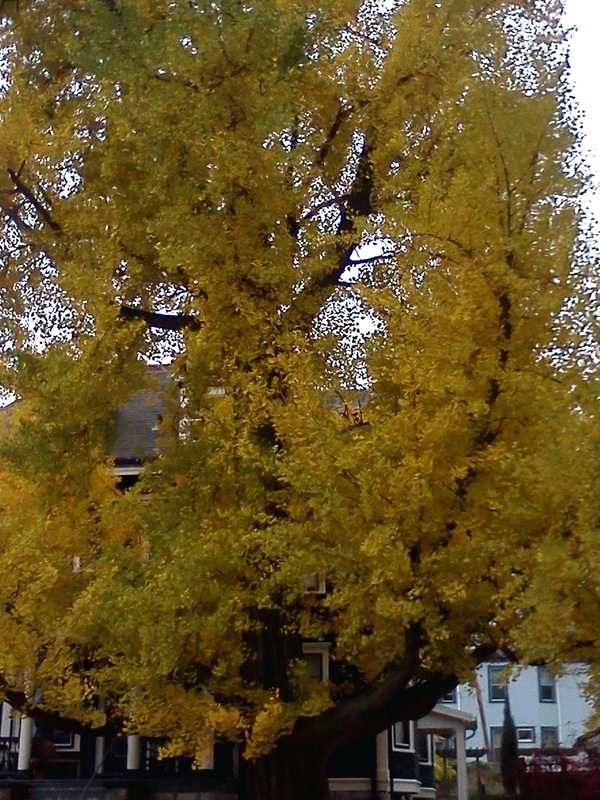 Although the ginkgoes that once graced the south lawn of the Martin House had to be removed (due to their roots that threatened the house's foundation), an even more mature example stands almost directly across Jewett Parkway (above), providing a luminous array of yellow-gold leaves that easily could have been Wright's original inspiration for the autumnal palette for the Martin interior. Now I am 'guessing' here - but; when I went to the house a few weeks ago during the PBN Conf. it sure seemed to me that someone has put compact florescent bulbs in the fixtures. Light is way too blue/white and is not (IMHO) giving the interior it's due. Stockpile all the incadescents you can and keep the look that the Martin's saw!